Today we are excited to have Andie Hannah, a great teacher from Virginia, share her ideas about active processing. Andie’s remarks follow. This past spring semester, my 8th grade English class and I read Ray Bradbury’s Dandelion Wine. I was a little nervous about the choice—I love the book, especially the way Bradbury reflects back on and uncovers so much meaning and significance from one twelve-year-old’s summer. But would 13-year-olds get this, being almost the same age as the main character? And there’s not really a driving, overarching plot either; it’s really just a beautifully written collage of incidents and experiences. Would middle-schoolers get into it at all? Thankfully, Bradbury’s word craft and curious stories drew them in. They enjoyed it and were engaged with it more than I expected. And there was also much active processing involved—which made this novel unit one of the best of the whole year. Dandelion Wine is full of themes and symbols that express those themes; ideas about the role of technology in a modern world, what it means to know that death is inevitable and still live life to the fullest, etc. I wanted my students to come to their own understanding of these themes and how the symbols in the text expressed them. Before we started reading, students completed an anticipation guide—something many teachers use. Students are asked to rate their perspective on statements (often strongly worded) about thematic topics—from “strongly disagree” to “strongly agree.” I find that student engagement is easy when they get to talk about/debate/argue about topics they feel strongly about. 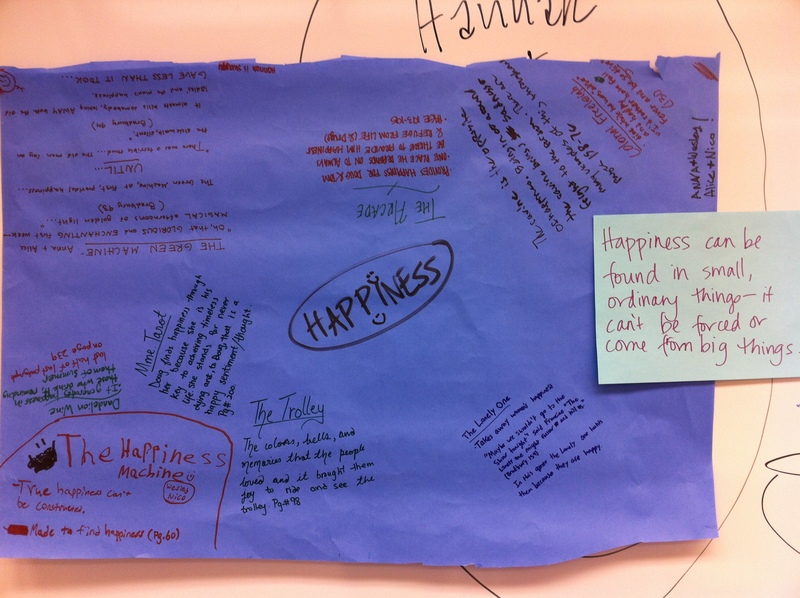 I have had some of the best classroom discussions come out of anticipation guides—and then from the start, students are thinking about the major themes in the novel, as well as evaluating their own understandings, comparing them to others’, and building personal connections with the characters and events in the story. As students read the novel—whether at home or when we found time in class to read sections aloud—they “tagged” (marked with post-it notes) symbols (with one color note) and themes (in another color). It became a kind of scavenger hunt—especially in class, students would compete to be the first to identify references to specific themes and symbols. Students had to individually actively process the text for meaning as they read. When we finished reading and were preparing for the dreaded final essay, which asked students to analyze what a specific symbol (or symbols) communicated about a key theme, we did rotating roundtables. 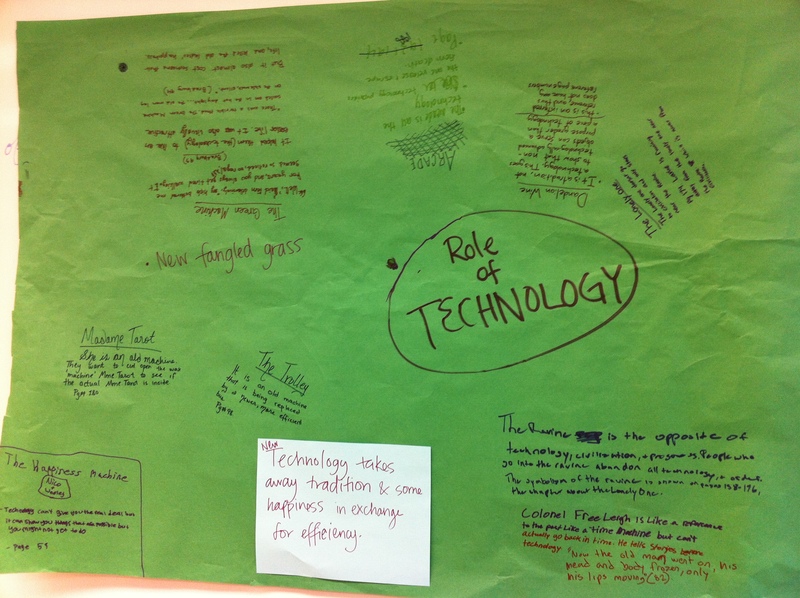 Large pieces of butcher paper were set on tables around the room, one with each of the major themes we discussed. Students worked in pairs, and each pair was assigned one symbol. They rotated around the tables and wrote notes about how their symbol related to the theme, provided textual evidence from their tags. Then we looked at each completed poster and discussed the possible overarching ideas the author was trying to communicate through the symbols. The final products were pretty cool. So how did these activities promote active processing? I got my students started on thinking about the big ideas and Ray Bradbury got them interested in the text, and then the students considered their own thoughts, discovered new perspectives on those ideas in the text, and then analyzed and connected literary symbols with those ideas. Some of the processing was individual (tagging), some was in small groups (pairs working on the roundtables), and some was part of whole class discussion, but all of it was students working towards their own understandings about the deep stuff of life.